We’re back in action here at Mad Maggies Central after a short hiatus while GDub and I took a 10,000 mile train trip across Canada. More about that later. (It was spectacular!) But now we are ready to kick up some dust and we’ve got two fun shows this weekend at which to do just that. 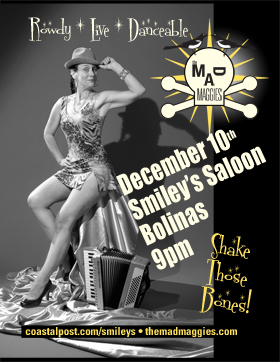 December 10 – Friday night – Smiley’s Saloon in Bolinas. We’re playing all night long starting at around 9pm so come early, stay late. 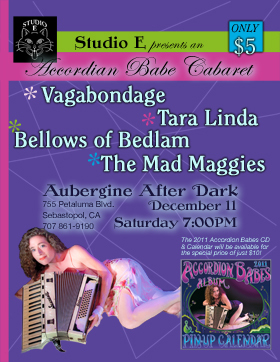 Studio E presents this Accordion Babes Cabaret featuring four fabulous accordionistas and their bands. 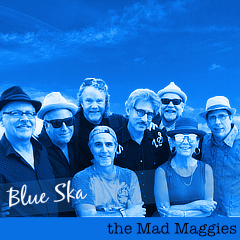 This show starts at an early 7pm and you will want to be there from the beginning! Only $5. All ages. And the 2011 Accordion Babes Calendars with CD will be available for the very special price of just $10!! On the Radio! Before the Saturday 11 show several of us accordion babes will be chatting and playing live on “Our Roots Are Showing” hosted by Steve Delap and Robin Pressman on KRCB, radio – 91FM. Tune in between 1-5pm. Live stream or on the airwaves. accordion babes, Aubergine, Bolinas, internet radio, live music, Smiley's Saloon.